Tears sprung to my eyes upon reading internationally acclaimed author Han Kang’s opinion piece in the New York Times. Never in my life have I been moved to tears by any article. Was it Han Kang’s talent as a writer? No. It was because she had so perfectly expressed the anguish of the Korean people. The reason the words of this nation’s president strike such fear in our hearts is because this nation is one of the major nuclear powers of the world. It is the only nation that has ever used nuclear weapons on another country. Even the mention of “war” conjures the immediate image of Hiroshima and Nagasaki in Japan, devastated by this nation’s nuclear bombings. “Little Boy” and “Fat Man” obliterated half the population in these cities without even leaving a trace. People still suffer three or four generations down the line due to hereditary radiation poisoning, which has taken 700,000 lives since the bombing. Radiation and nuclear warfare are terrifying scenarios, but equally as frightening is the carpet-bombing by U.S. warplanes. The nation with the current highest military defense budget in the world dropped more bombs on the tiny area of the Korean peninsula during the Korean War than all the bombs dropped by every country in World War II. One thousand bombs per square kilometer were dropped on Pyongyang during the Korean War, the destruction leaving only two buildings standing in the entire city. General Curtis LeMay, who commanded the Strategic Air Force during the Korean War, said in 1984 that U.S. forces “killed off 20 percent of the population.” Former Secretary of State Dean Rusk, who was highly influential in the United States’ decision to be involved in the Korean War, said the U.S. bombed “everything that moved in North Korea, every brick standing on top of another.” In the second half of this war, U.S. bombers flew low and destroyed hydroelectric and irrigation to purposely flood and destroy the farmlands and crops of Korean people. If a war like this broke out again, it would be the most terrible experience of my life. The thought of people dying and killed by war is horrible to even imagine. I was unsure what to do in response to President Trump casually threatening war in Korea on Twitter a few weeks ago. Constituents I voted into my local districts, National Assembly, even the South Korean President could not reach Trump. Koreans are overwhelmed by this helplessness. On September 19th, President Trump gave a speech to the United Nations calling to “totally destroy” North Korea. It was shocking. It felt like he would unleash “fire and fury” on the Korean peninsula as soon as tomorrow. I couldn’t stand it any longer. I knew that if I went on with my life and didn’t act now, I would be filled with remorse if the scenario I couldn’t bear to imagine actually came to pass. I decided not to go on the average “trip to America,” but a “struggle to America” to stop Trump. 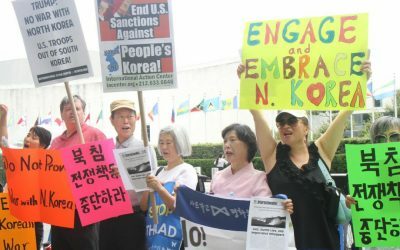 Young people in their twenties and thirties willingly gave up a week of classes, work, and part time jobs to travel to Washington, D.C. to oppose war on the Korean peninsula. Our plan was to meet President Trump at the White House and use our “No War” dance performance to connect face-to-face with the American people. However, four hours before our departure, American authorities denied our entry to the United States, singling us out among thousands of travelers at Incheon International that day. Why? We received no explanation. One news outlet released a headline describing us as a foreign militant force that was refused entry to the United States. Who could we possibly be to be denied entry to the United States? What is so threatening about a group of 15 youths? Are we viewed in the same classification as influential politicians or terrorist organizations? All we had packed were pickets, clothes, and musical instruments in our plain luggage trunks. The activities we had planned for America – our press conference, candlelight rallies, and dance – we performed in front of the U.S. Embassy instead. We were joined by other brave Koreans who oppose Trump’s visit to Korea in November. We fear a re-kindling of the unended Korean War in the name of “peace.” We fear more massacres on the Korean peninsula in the name of “peace.” We fear that the nation that enforces intense sanctions on North Korea in the name of “peace,” and the President who has denied our entry to the United States, may ultimately bring war to our Land of the Morning Calm. We want to prevent another war on the Korean peninsula. The American flag flutters in front of the U.S. Embassy as we write. We do not want carpet-bombs to drop above our heads, with the same flag painted on the planes. 뉴욕타임즈에 실린 한 유명작가의 기고문을 보면서 눈물이 났다. 기고문을 읽으며 눈물이 난 건 내 생애 처음이었다. 한강 씨가 글을 잘 썼기 때문일까. 아니다. 한국인들이 느끼는 심정을 너무나 정확하게 표현했기 때문이다. 속상하고 화가 났던 지난 몇 주였다. 다른 나라의 대통령이 아무렇지도 않게 우리나라 전쟁 가능성에 대해 떠들어 대고 수천명이 죽어도 상관없다는 식의 발언들을 일삼았다. 그 나라는 알고 보면 은근 ‘평화’라는 단어를 즐겨 쓰는 나라였다. 세계평화를 위해 항상 다른 나라의 인권을 걱정하고 자유를 염려하며 또는 정부군, 내지 반군을 도와주는 ‘착한 국가’다. 그런 나라가 지금은 “한반도에서의 전쟁”이란 표현을 수시로 담고 있다. 그 나라 대통령 말이 우리에게 공포로 다가온 것은 세계에서 가장 많은 핵무기를 가진 나라이기 때문이다. 세계에서 유일하게 핵무기를 직접 실전에 투입했던 나라이기도 하다. “전쟁”을 이야기하면 바로 “핵으로 초토화된 일본 히로시마와 나가사끼” 사진이 생각난다. “리틀보이”와 “팻맨”은 그 자리에서 인구 절반을 흔적도 남기지 않고 제거시켰다. 방사능 유전성 희귀질환으로 고통받는 피복자들도 3대, 4대까지 이어지고 있고 총 70만명이 방사능 피해로 사망했다. 방사능, 핵에 대한 공포. 무섭다. 그것만큼 두려운 것은 미국비행기의 융단폭격이다. 현재 세계에서 가장 많은 국방비를 쓰는 나라는 2차 세계대전 당시보다 더 많은 폭탄을 한국전쟁 당시 좁은 땅 한반도에 썼다. 전쟁 때 평양에 솟아오른 건물이 단 2채에 불과할 정도로 1평방킬로미터 당 1천개의 폭탄이 투여되었다. 한국전쟁 당시 전략공군사령관이었던 커티스 르 메이 장군은 1984년 “3년 이상 우리는 인구의 20%를 죽였다”고 실토했고 이 전쟁의 후원자, 국무장관을 지낸 딘 러스크는 “미국은 북한 땅 위에서 움직이는 모든 것, 벽돌로 쌓아놓은 모든 것을 겨냥해 폭격했다”고 말했다. 전쟁 후반기에는 미군 폭격기가 저공비행하여 수력-관개 댐을 파괴하고 농지를 범람하게 하여 농작물을 모조리 떠내려 보냈다. 전쟁이 나면 내 인생 가장 최악의 순간이 될 것이다. 전쟁으로 사람들이 죽어가고 피폭되는 광경은 상상만 해도 끔찍하다. 그런데 불과 몇 주 전만 해도 난 미국 대통령 트럼프의 가볍게 날린듯한 전쟁 언급 “트윗”에 어떤 대응을 해야될지 몰랐다. 내가 투표로 당선시킨 지역구 국회의원, 대통령도 트럼프에게 한마디도 하지 못했다. 한국인들은 그렇게 무력감에 휩쌓여 있었다. 9월 19일 트럼프 대통령이 “북한을 완전히 초토화시키겠다”라고 주장한 유엔연설을 했다. 세계 앞에서 사실상 전쟁을 일으키겠다고 선포한 것이다. 충격적이었다. 당장 내일이라도 한반도를 “화염과 절망”속에 집어넣을 것만 같았다. 이제는 가만히 있을 수 없었다. 그저 일상을 살다가 진짜 내가 상상하기 싫은 현실에 맞닥뜨리는 순간 아무 것도 하지 않았다는 자책감이 들 것 같았다. 결국 나는 “미국여행”이 아닌 “미국투쟁”을 결단했다. 트럼프를 막기 위해. 2-30대 청년들은 한반도 핵전쟁을 막기 위해 1주일간의 수업, 직장생활, 아르바이트 등을 다 포기하고 워싱턴DC행을 택했다. 트럼프 대통령을 만나러 백악관을 가고 미국시민들 앞에서 “전쟁반대” 춤을 추며 마주하게 될 미국 방문을 구상했다. 그런데 출국 4시간 전 인천국제공항에 있었던 수천명의 여행객들 중 우리는 유일하게 미국입국이 거부되었다. 왜? 이유를 듣지 못했다. 왜? 절대 알려줄 수 없단다. 한 뉴스 헤드라인이 떠올랐다. 어느 나라 군 통수권자가 미국 입국이 거부되어 반발했다는. 도대체 우리가 뭐길래 미국은 입국을 거부했는가. 우리 15명의 방탄청년단이 그렇게 “위협적인 존재”인가. 우리가 여느 영향력 있는 정치인, ‘전문테러집단’과 같은 급으로 여겨진 것일까. 지극히 평범한 우린 단지 트렁크에 피켓과 몇몇 옷가지, 악기만 챙겼는데. 우리는 이대로 멈추지 않는다. 공항에서 되돌아온 우리는 미국 깃발이 펄럭이는 한국 미대사관 앞에 돗자리를 깔고 앉았다. 우리의 미국 입국이 불편했다면, 우리도 트럼프 입국이 불편하다! 미국에서 하려고 했던 행동들 – 기자회견, 촛불집회, 퍼포먼스 등을 이어갔다. 트럼프 방한을 반대하는 용기있는 한국인들도 동참했다. 우리는 단지 지상에서 끊이지 않는 “평화”라는 이름의 한반도전쟁을 두려워했을 뿐이다. 우리는 지상에서 끊이지 않는 “평화”라는 이름의 학살이 이 땅 한반도에 있을까봐 걱정했을 뿐이다. 결국 우리 방미를 막은 트럼프는 한반도에서의 “전쟁”을 선택하고 싶은 것일까? 우리는 “한반도 땅의 전쟁”이라는 시나리오를 막고 싶다. 어떻게 해야 할까. 미 대사관 앞. 글을 쓰는 이 시각도 성조기는 펄럭이고 있다. 우리는 단지 바란다. 성조기가 찍힌 비행기가 내 머리 위에서 폭탄을 투하하지 않기를.